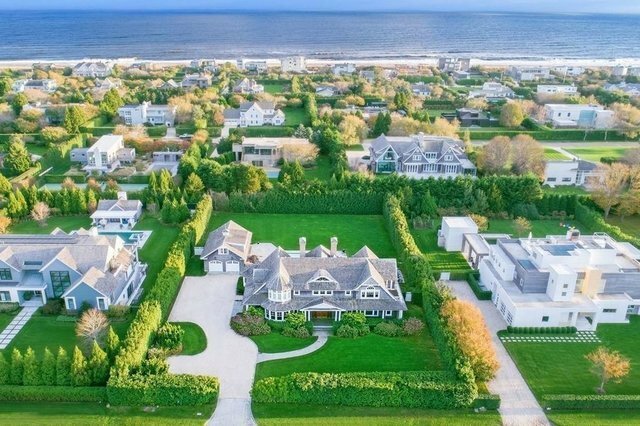 Perfectly maintained, this magnificent traditional is sited in one of the Hamptons most coveted locations, This rare offering provides private deeded ocean access along with a deeded pathway to Sagg Pond. Custom built with top quality materials, this 5,200+/- sf Bridgehampton south traditional features five generously sized bedrooms, six full baths, and two powder rooms. The open kitchen with breakfast seating and walk-in pantry leads to the formal dining room. Light-filled and open, the living room has a large sandstone fireplace and doors leading to the immaculate grounds. Upstairs, the master suite has a fireplace, spacious bathroom, and an expansive terrace. On nearly one acre, the manicured property features a heated gunite pool and a detached two-car garage/pool house with living areas, a full bath, and a kitchenette. The full basement can easily be finished or used for storage.